As a kid who feasted on pulp fiction, Seamus Heffernan thought the coolest guy in the room only needed two things – a tan trench coat and enough grit to pave the Trans-Canada Highway. 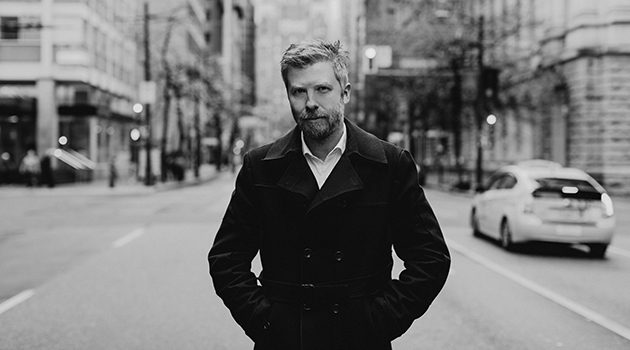 Seven years, 7,000 kilometers and one master’s degree later, and Heffernan finally has his own flawed hero in Thaddeus Grayle, the protagonist in his debut novel Napalm Hearts – being celebra ted with today’s launch party from 6-8 p.m. at UFV’s Alumni Hall. A Newfoundland native, Heffernan chipped away at the book for years, but credits time with UFV’s student-run literary and visual arts magazine, Louden Singletree, for pushing him to complete the novel. “It really gave me the gas in the tank to finish,” he says. 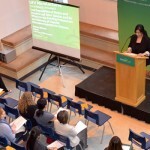 That connection to UFV continues to this day. Crossing UFV’s convocation stage to receive his master’s degree in Criminology last June wasn’t the last time Heffernan attended a major UFV event, thanks to his role as constituency manager for Mission-Matsqui-Fraser Canyon MP Jati Sidhu. As recently as last week, Heffernan joined hundreds of others in celebrating the installation of new UFV chancellor Andy Sidhu. While Sidhu’s installation went off without a hitch, the same can’t be said for the lives led by colourful characters created by Heffernan. According to its press release, Napalm Hearts is the story of Grayle, a successful-but-bored American private investigator specializing in infidelity cases in London, England. An opportunity to find a wealthy businessman’s missing (and much younger) wife arises, and he jumps at the chance to do some real detective work. The case sinks him deep into a dangerous and amoral underworld he may regret entering, however—if he’s lucky enough to make it out alive. 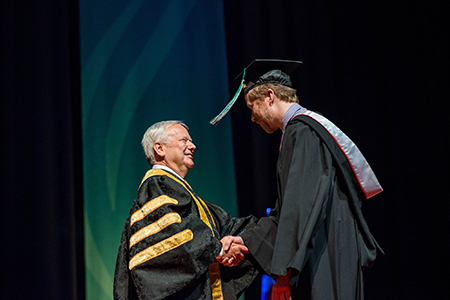 Seamus Heffernan is congratulated by UFV President Mark Evered while crossing the stage at convocation in 2017. Shortly after his experience with Louden Singletree, Heffernan hired a professional editor, then shopped the completed book to publishers. Shortly thereafter, Napalm Hearts was picked up by Crooked Cat. 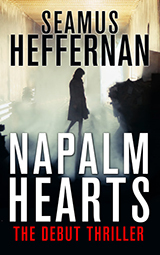 Napalm Hearts is available in hard copy and digital download from Amazon, and other places fine books are sold. The Napalm Hearts launch party runs April 24 from 6-8 p.m. at UFV’s Alumni Hall, in B Building on the Abbotsford Campus. Congratulations Seamus! I look forward to reading Napalm Hearts. Enjoy your launch, and have a good time.